Was Lord Hanuman born in Sumeru? Where is that place? Is it renamed recently? Where is Sumeru? I have been reading about Hindu Cosmology of seven continents and in that I came across Mount Sumeru. Where is it? Is it the birth place of Hanuman? Was Lord Hanuman born in Sumeru? Is it the birth place of Hanuman? [The ascetic Agastya said to Lord Shri Rama:] I am not capable of describing to thee the wondrous childish feat which Hanuman did perform in his boyhood. But if thou art, O Raghava, greatly anxious to hear it, I shall relate do thou hear with a quiescent mind. Hanuman's father Kesari reigned in the mountain Sumeru which resembles gold by the inluence of the sun. Kesari had a well known wife by the name of Anjana to whom he was greatly attached. The deity Wind begot on Anjana an excellent son. Repairing to a dense forest for collecting fruits, the excellent damsel gave birth to Hanuman. Beholding his son Riksharaja with his sons(Vali and Sigriva), Brahma, the grand father of the Devas, consoled him in diverse ways. Then he ordered the celestial messenger saying "At my behest, O emissary, do thou proceed to the highly picturesque city of Kishkindha. That golden, big and charming city is worthy of Riksharaja. Do thou place there Riksharaja, the foremost of Vanaras, with his sons; and having invited the leading Vanaras and others and received them courteously do thou install him on the throne. On beholding this Vanara chief, gifted with intelligence they shall be all subject to him." Brahma, having said this, the celestial emissary, with Riksharaja before him, proceeded to the highly picturesque city of Kishkindha. And having entered there with the velocity of the wind, he, at the com mand of the Patriarch, crowned the leading Vanara Riksharaja as king. All the Vanara, residing on earth consisting of seven insular continentsand bounded by ocean, came under his subjection. 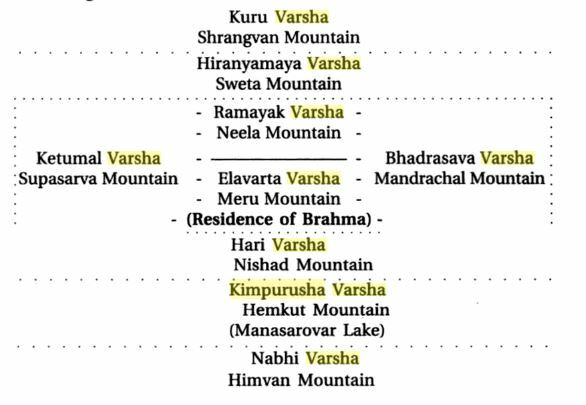 So, Hanuman, Sugriv and Vali were born on mountain Sumeru but later migrated to Kishkindha. The planetary system known as Bhū-maṇḍala resembles a lotus flower, and its seven islands resemble the whorl of that flower. The length and breadth of the island known as Jambūdvīpa, which is situated in the middle of the whorl. In Jambūdvīpa there are nine divisions of land. Amidst these divisions, or varṣas, is the varṣa named Ilāvṛta, which is situated in the middle of the whorl of the lotus. Within Ilāvṛta-varṣa is Sumeru Mountain. More details can be found in this article and in this answer. Though the Valmiki Ramayan proper does not mention the exact place of Hanuman's birth, Uttar Ramayan does say it to be Sumeru. However. local legend makes it to be Anjaneri near Nashik in Maharashtra and since Hanuman spent his whole life around Rishyamukh Parvat in Kishkindha which falls in modern day Karnataka, it seems logical that he would have been born somewhere in the Deccan rather than at Meru mountain which is located way up in the north. Jambu-dwípa is in the centre of all these: and in the centre of this continent is the golden mountain Meru. The height of Meru is eighty-four thousand Yojanas; and its depth below the surface of the earth is sixteen thousand. Its diameter at the summit is thirty-two thousand Yojanas; and at its base, sixteen thousand: so that this mountain is like the seed-cup of the lotus of the earth. The boundary mountains (of the earth) are Himaván, Hemakút́a, and Nishadha, which lie SOUTH of Meru; and Níla, Śweta, and Śringí, which are situated to the NORTH of it. The Varshas or countries between these ranges are Bhárata, south of the Himaván mountains; next Kimpurusha, north of the latter, and south of Nishadha, is Harivarsha; north of Meru is Ramyaka, extending from the Níla to the Śweta mountains; Hirańmaya lies between the Śweta and Śringí ranges; and Uttarakuru is beyond the latter, following the same direction as Bhárata. Each of these is nine thousand Yojanas in extent. Ilávrita is of similar dimensions, but in the centre of it is the golden mountain Meru, and the country extends nine thousand Yojanas in each direction from the four sides of the mountain. There are four mountains in this Varsha, formed as buttresses to Meru, each ten thousand Yojanas in elevation: that on the east is called Mandara; that on the south, Gandhamádana; that on the west, Vipula; and that on the north, Supárśwa. The country of Bhadráśwa lies on the east of Meru, and Ketumála on the west; and between these two is the region of Ilávrita. Please note BhArat is mentioned as Nabhi Varsha in the image above because that was its early name. As you can see, according to the Puranic geography, Meru exists bang in the middle of the earth in the center of the Ilavrita Varsha while Hanuman lived in Bharat Varsha which is south of the Himalayas. Not the answer you're looking for? Browse other questions tagged hanuman geography . What is a difference between Lord Hanuman and Lord Panchmukhi Hanuman? Are they same? When did Rama tell Hanuman the Muktika Upanishad? Is Kailāsa mansarovar actually in Tibet, China? Why did Lord Hanuman bring two mountains from Himalayas?